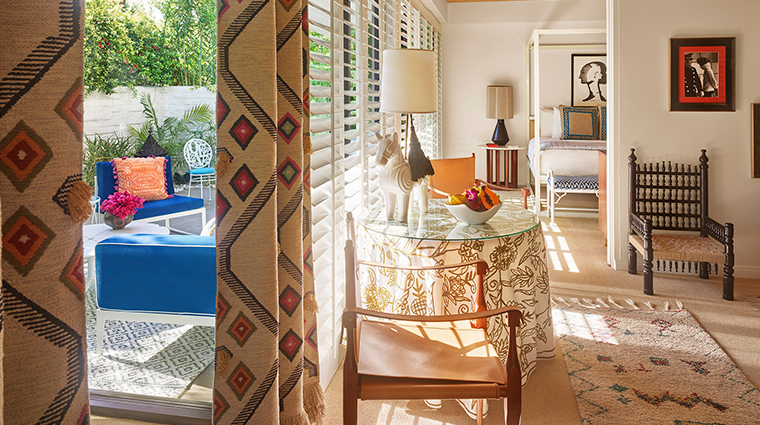 The luxurious but cheeky spirit of Parker Palm Springs is obvious from the moment you arrive at the 23-foot breeze block wall and step through the hotel’s towering, tangerine doors. This midcentury retreat isn’t just a place to rest your head, it’s a destination that will fill it with whimsy and wonder. 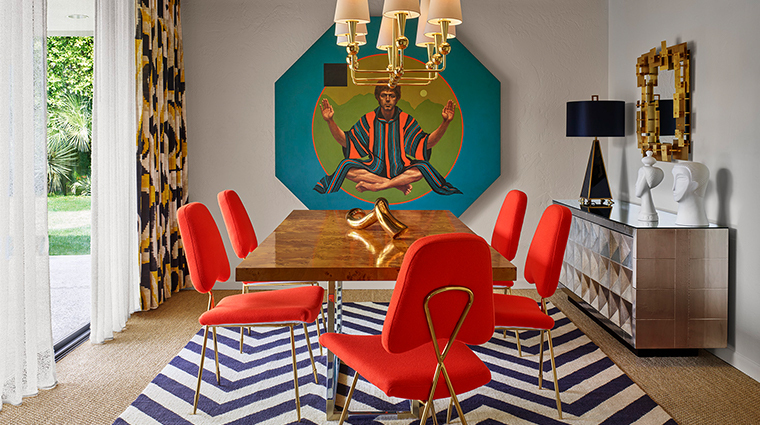 You’ll find a bold Jonathan Adler-designed interior in a style best described as eccentric glamour. 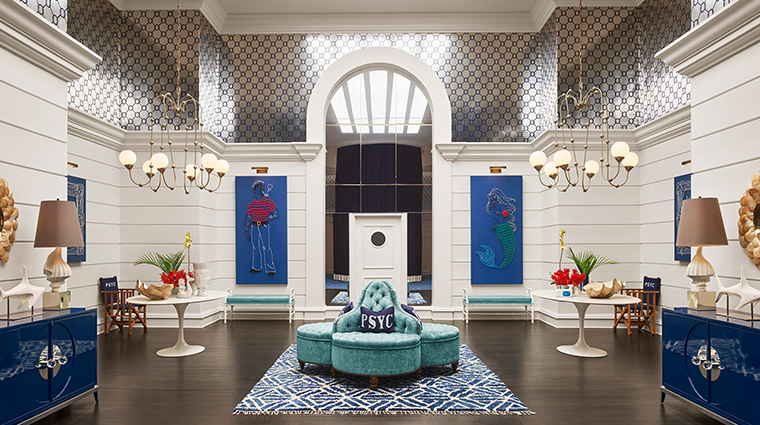 You can’t miss the suit of armor posted near the entrance, groovy carpeting creeping up the staircase or the quirky knick-knacks scattered about the lobby. 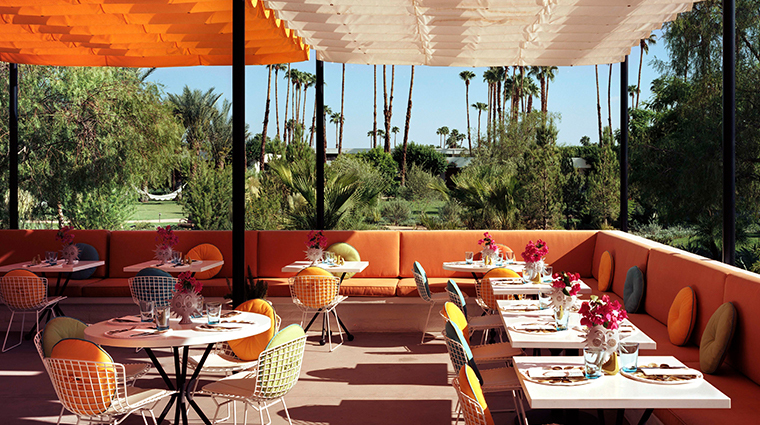 A year-round getaway for posh celebrities and travelers in search of haute fun, the Palm Springs hotel is all about indulging in whatever makes you feel good. 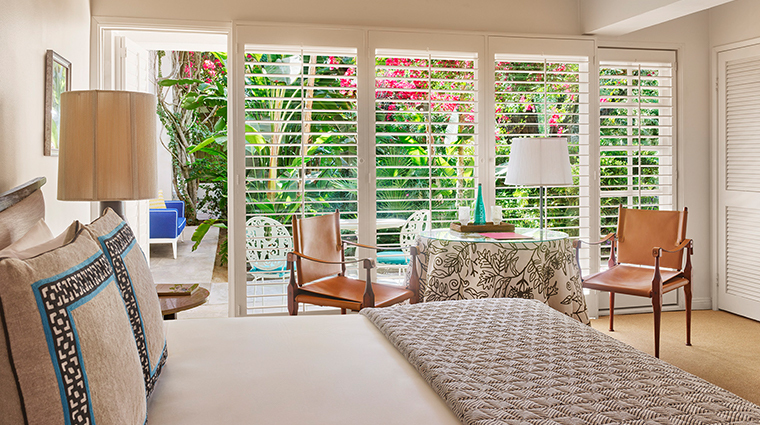 Whether you spend the afternoon lolling in a hammock with fresh-squeezed lemonade, playing a game of pétanque before retreating to your spacious lanai room or indulging in eggs Benedict at 3 p.m., happiness is what’s on the menu, and the Parker is pleased to bring it to you. You’ll feel like Alice upon her arrival in Wonderland amid the estate’s thick foliage, crushed granite pathways and secret nooks. 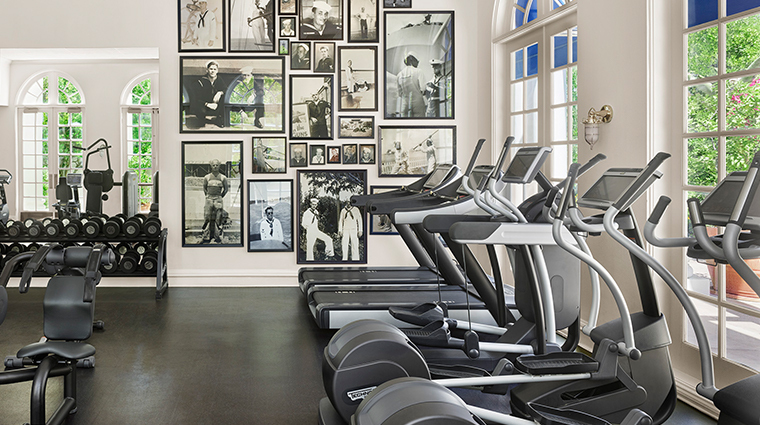 A meander around the property reveals treasures at every turn, including rose gardens, a manicured croquet court and even a seven-foot-tall bronze banana statue. 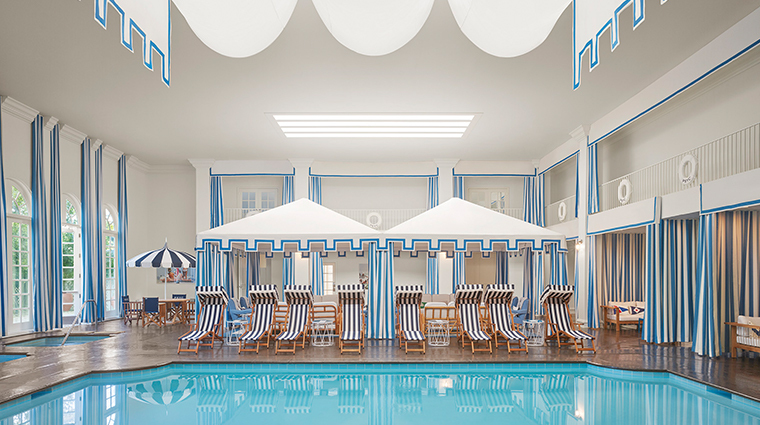 The hotel is the picture of midcentury-modern charm. If you like your design bold, bright and fun, this is the place for you. In the sunbaked desert, taking a dip is almost mandatory, and each of the Parker’s three turquoise saline pools — two fringed by palm trees, one indoors — offers respite and relief. 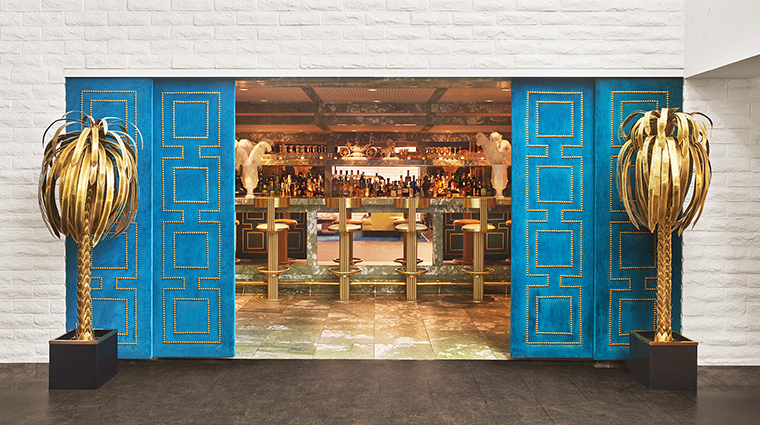 Generous hours at Mini Bar, a jewel-box-like space in the luxury hotel’s south building, mean you can either start the evening here or end it — or both. Though the bar itself only has a few stools, you can bring your libations to the adjoining lounge, an inviting area with hanging chairs, plush pillows and comfy love seats. If the flooring looks familiar, that’s because it’s a replica of the carpet in The Shining’s Overlook Hotel. Guests have been known to dress up as movie characters and stage photos in the hallway on Halloween. Originally California’s first Holiday Inn, the property was purchased by cowboy crooner Gene Autry in 1961 to house his baseball team, the Los Angeles Angels. 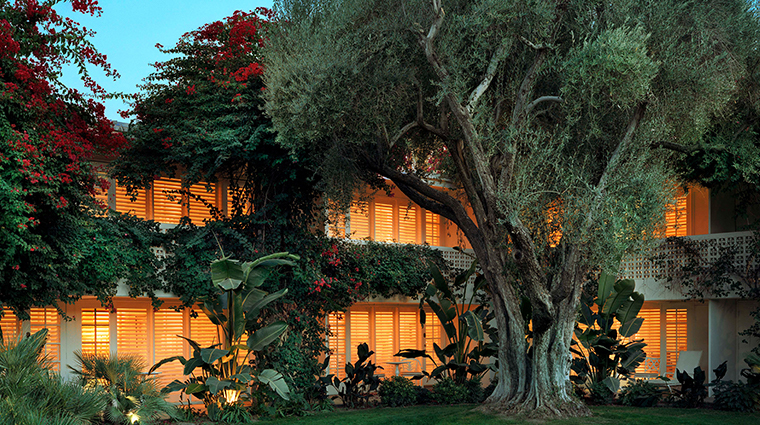 It was later snapped up by Merv Griffin and transformed into a resort hotel and Givenchy spa before it became Parker Palm Springs. 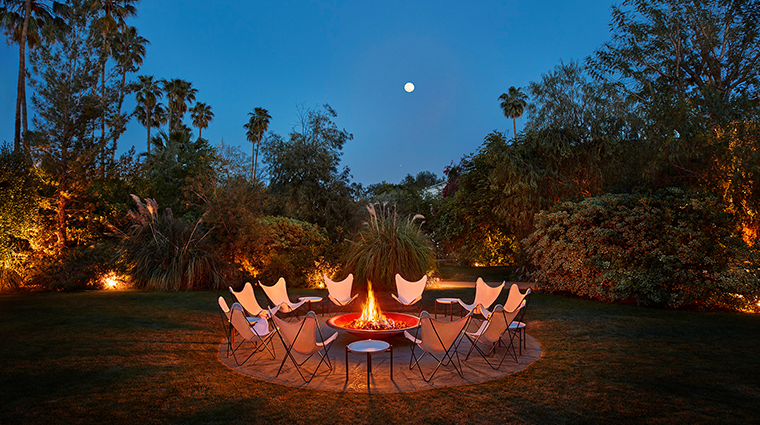 The cozy outdoor fire pit is lit at sunset, just as the nearby Santa Rosa and San Jacinto mountains are dappled with dramatic pink and gold. 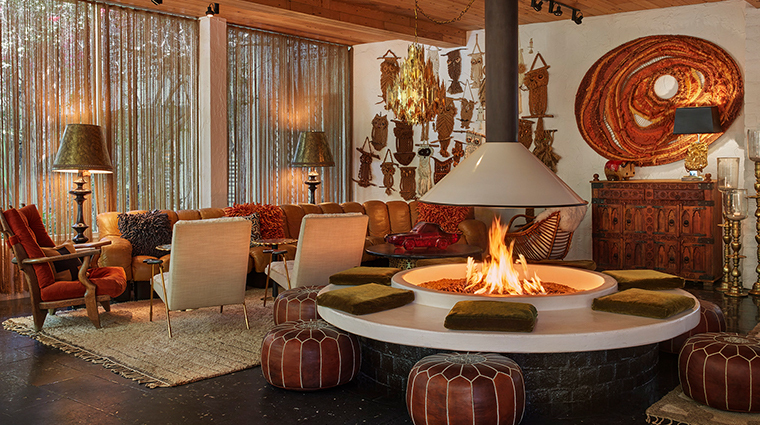 Complete the rustic ambiance with room service s’mores delivered fireside. Tennis aficionados should make time to play on the resort’s clay courts, a rarity in the desert because of the maintenance they require. 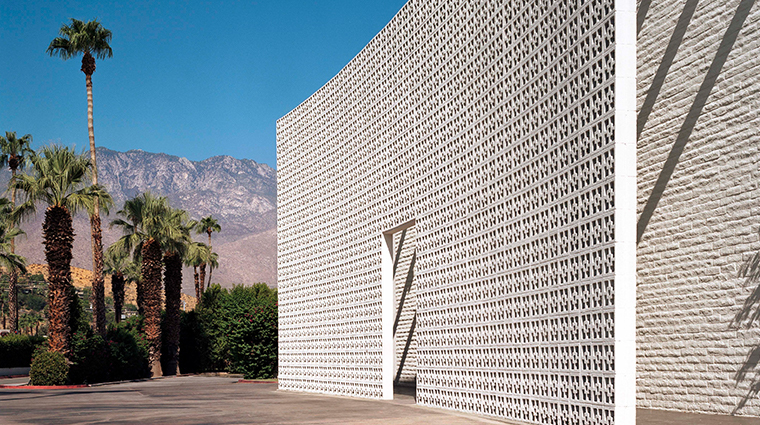 Located in south Palm Springs, the hotel affords easy access to hiking trails, the Backstreet Art District and modernist architectural gems. The unique property is also just a quick 10-minute drive from downtown. 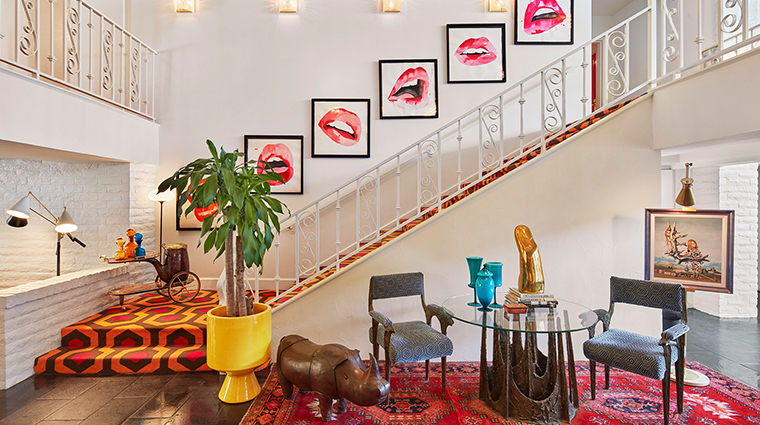 All 144 rooms in the Palm Springs hotel show off Jonathan Adler’s signature style: a bold but carefully curated mix of materials, glamorous graphic prints and reimagined vintage pieces. 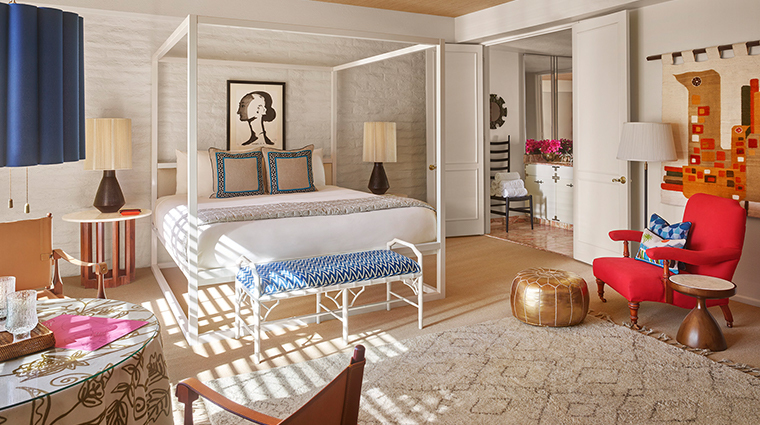 Designer amenities adorn the bathrooms, including products from Acqua di Parma, Hermès and L’Occitane. Twelve standalone villas provide both seclusion and space. Each accommodation is configured with one bedroom, a stylish and spacious living room, a dining area and a private patio. 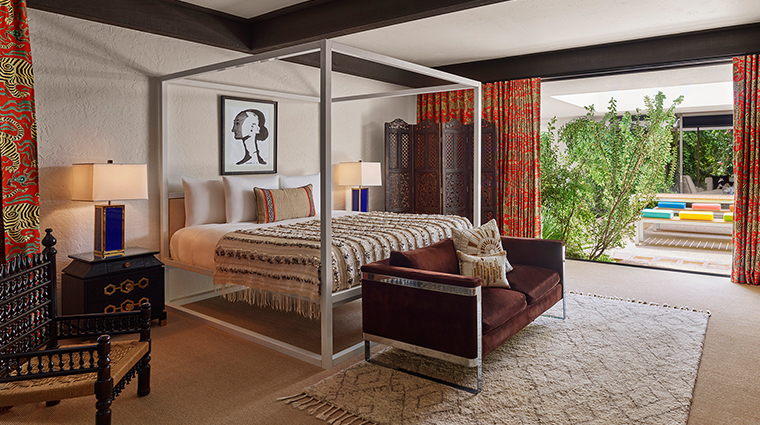 Those who desire a home away from home should opt for the Gene Autry residence, a two-bedroom villa that was once the actor’s house, complete with a full kitchen, a treatment room with sauna and a film screening room. Norma’s serves a sweet and savory breakfast menu all day long. The portions are generous and the plating is exceptional, making each delicious dish perfect for Instagram-worthy brunch shots. 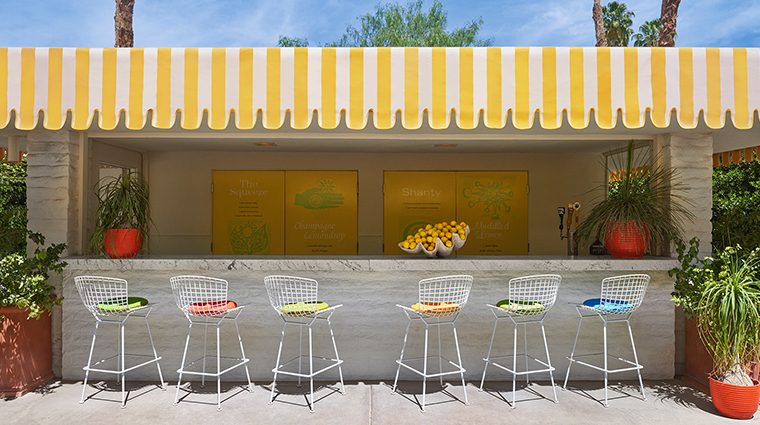 Quench your thirst at the poolside Lemonade Stand, where frozen rosé and limoncello-soaked sugar cubes share the menu with poolside classics like the Aperol spritz. Prawn ceviche and street-style tacos provide sustenance between laps. Dim, discreet and pulsing with funk music, Mister Parker’s is a restaurant that feels more like a trendy, underground club. Here, you’ll find classic French fare, like escargots, steak au poivre and caviar. 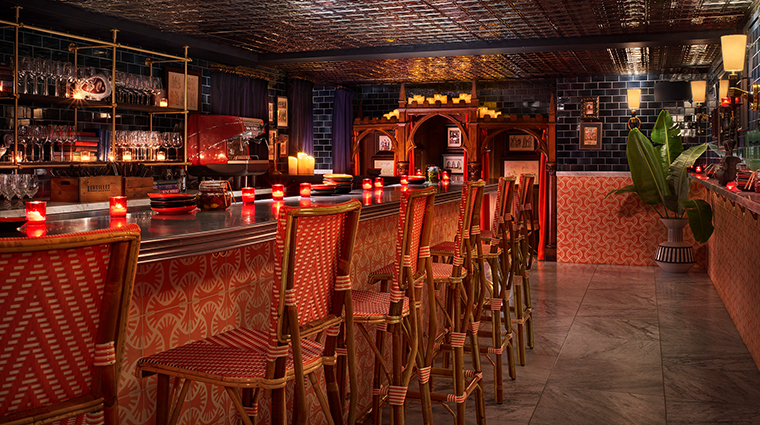 Counter Reformation is a slender wine bar with a real confessional booth tucked along the back wall. Beyond the epic vino list, the menu includes shareable plates of decadent delights, like braised artichoke hearts, foie gras macarons and jamón Ibérico.